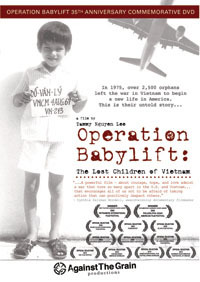 Synopsis: “Operation Babylift” was a $2 million U.S. initiative that airlifted over 2,500 Vietnamese orphans out of a war-torn country to protect them from the impending threat of the Communist Regime. Coined by some as “one of the most humanitarian efforts in history,” it was also plagued by lawsuits and political turmoil. Even with the best intentions, these adoptees grew up facing a unique set of challenges in America, including prejudice overshadowed by a controversial war and cultural identity crisis. Nearly 35 years later, this award-winning documentary takes a candid look at a significant, yet untold event as seen through the eyes of the volunteers, parents, and organizations directly involved, showing a contemporary look at Babylift and its relevance to international adoption today through the eyes of the adoptees themselves. Through honest and emotional testimonials, it uncovers the “lost” stories of the adoptees and who they have become as adults, revealing their compelling struggles and triumps, and giving them an opportunity to share their journey from their own perspective and make peace with their controversial past. The movie features compelling and insightful interviews from a cross-section of adoptees and Babylift volunteers. Music is from emerging Asian American artists, including Jared Rehberg and Thomas’ Apartment. Following the international acclaim of Operation Babylift: The Lost Children of Vietnam, Tammy began producing/directing Light of Day, her newest documentary film project, which will give voice to another set of controversial and untold stories of domestic violence against Asian women and children. The project features interviews from survivors and domestic violence agency leaders in North Texas. To tell this story in a fresh and innovative way, the project will also feature animation and art created by Asian American students and music by emerging Asian American musicians for its score and soundtrack. The topic of the film will bring awareness to the unique issues facing women of Asian origin in regards to gender based violence and be a tool for community outreach and awareness.